Please post in this thread if you are selling your Daft Punk helmet, kit, mould, parts etc. Only one post per sale, you may link through to another thread if one exists for your project. Buyers, please contact the sellers individually not via this thread. Important: please make sure you post up all of the following information (feel free to copy and paste this template with the explanations chopped out), and most importantly update your post to let us know when it's sold! Member: is it a Guy Man or Thomas helmet, or both! Condition: if it's not complete list what still needs doing. Key Features: anything you're particularly proud of or key points to mention. Links: link through to any existing threads on the Daft Club or external image galleries. Preferred Contact: what's your preferred method of being contacted (we recommend a Private Message). Image: where possible please provide some sensible sized images, for high res or large galleries please link through to another page. Details: tell us a little more about the project, why you built it, why you're selling etc. And don't forget you can also post a request in our want to buy a Daft Punk helmet thread if you can't find what you're after here. Last edited by Spud in Disguise; 21st Mar 2012 at 21:16. Last edited by Thomas Bangalter; 29th Jan 2013 at 01:44. 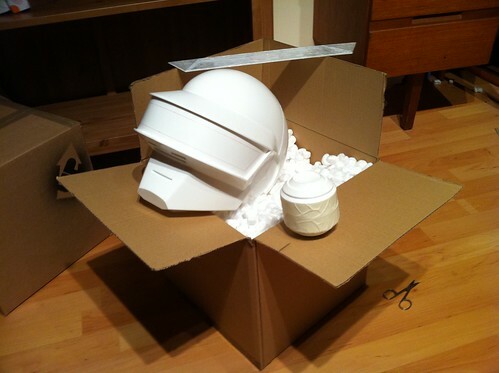 This kit contains the parts required to create a Thomas Bangalter style helmet! Raw kit which will require very little work to reach a high quality finished product. This will include trimming, sanding, minor filling and finishing in a style of your choice. The inside will also require padding at the sides, similar to a pushbike helmet for a secure comfortable fit. The helmet has been made to fit my head (similar to how the original was made) and therefore you must make sure that it will fit before you buy. My head measures 57cm around the crown which is the size of the average male head. Any head smaller than this size will fit. The helmet and ear pucks have been cast from high quality polyurethane resin (smooth-on smoothcast 65 R, renowned for being the best material available for this purpose) making the helmet extremely high quality and durable. The material is also very easy to cut, sand, glue and drill, allowing you to achieve a fantastic result with relative ease. The kit also includes a professionally laser cut visor; Made of high quality 2mm Perspex, the visor will provide a perfect optical clarity once heat bent to shape. If the buyer requires info on how to finish the helmet, there are endless amounts of tutorials, videos and forums which should help guide the buyer to create a finish to be proud of. Any finishing materials required such as bondo and spray paint etc will be easily obtainable from local stores. Helmets will be packaged extremely well. Parts are available such as spare or replacement visors and ear pucks. Pm me for details. Completion is up to the buyer. The buyer assumes responsibility for the completion of the helmet. Please ensure Your head will fit before bidding as no returns are accepted. Last edited by FIRE_WIRE; 5th Apr 2012 at 18:32.
yes we do "around the world"
Perfect size hmm 400 USD combined is a bit much though. Details: The helmet is complete/chromed. The only issue with it is that when I got it back it came back a gold/copper finish as you can see. other than that, the helmet is a fiberglass cast, so VERY sturdy! I think I might sell my helmets.